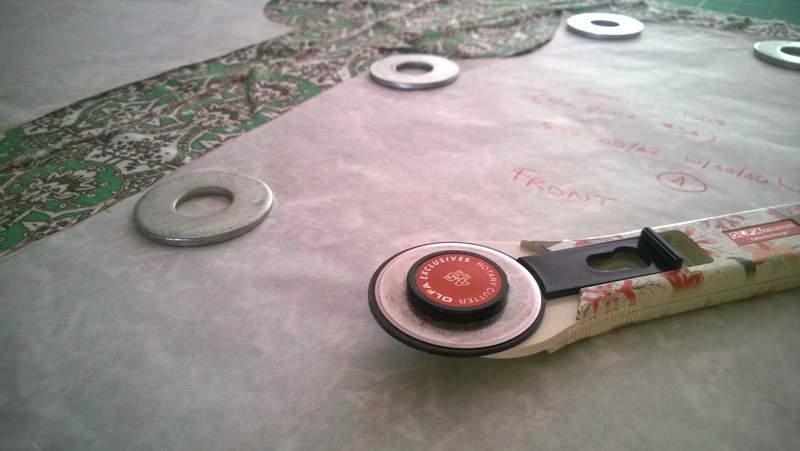 I finally got to Step 5 of my steps in sewing your own clothes: Cut out the fabric. My new mantra for this step is "just do it." I think many sewers, myself included, get a bit hesitant before taking scissors or rotary cutter to the fabric. Even if it's not expensive or precious fabric, I still pause, sometimes too long, before committing. But today I dove in and got 3 of the 4 summer tops cut out. I saved the last one, a plaid fabric, for tomorrow morning when it's hopefully cooler and I've had some rest. Some things just shouldn't be pushed. Cutting out the fabric does take some time to do properly. The first thing to do is prepare the fabric by folding it on grain, although I almost never cut out knits and jerseys on the fold because the bottom layer never seems to lay as flat as the top. In those cases I trace off the other half of the pattern and cut single layer. I'm using woven fabric for my summer tops so I cut out on the fold. The fabric in the above picture is rayon and was a little slippery but it was a 6 Euro remnant and this is a casual summer top I'm making so I cut on the fold. The plaid tomorrow will be single cut so I can match the plaid. Fortunately I didn't have any off-grain issues with my fabrics so preparing the fabric wasn't difficult, unlike a knit I once cut a top out of that had epic grain issues. I use the layout in the instructions as a guide but mostly just to make sure I cut out all the pieces. One lesson learned (the hard way) is to stop and look at the fabric for any direction in the print (or nap if it's solid) and make sure I have my pattern pieces going the right way. Sometimes a print has direction but it's ambiguous as to which way, so you have to make a decision and commit to it. One other little tip I can pass on is that I pin the smaller pattern pieces to the fabric so that I don't lose track of them or mistake a facing or collar for a scrap. Regarding scraps, I save a large piece for testing thread tension, button holes, to make sure the serger will stitch it correctly, etc. If there is a sizable piece, I save it for trying out sewing techniques, but I have to admit that my scrap bag is a bit full. Why is it so hard to throw fabric away? I do believe that working on the four summer tops all at once has been a real help toward getting past my "stuck" spots in sewing. Picking out four projects instead of one helped to alleviate some of the anxiety I have with "too many projects, too little time" and deciding what one thing did I want to make next, above all the other things I want to make. Also, it's been efficient to prepare the patterns and cut out the fabric for multiple projects because I can get my space and tools set up and get in the pattern tracing or cutting out mood. Of course when it comes time to sew I will do one at a time because of the different thread colors needed. I'm glad to know I'm not the only one who hesitates when cutting fabric. Sometimes I have to walk away, fix my glass of water, take a little rest before I start cutting. It's like a little panic attack knowing I can mess this up. We are always our worst critic sometimes. Can't wait to see your finished tops!